Shonen Jump NJ was near the beginning of when a new ruling meant that Thousand-Eyes Restrict could be flipped up manually the same turn that Tsukuyomi flips it down. This means that TER could consume a monster each turn in a loop. This ruling, and how players adapted to it, fundamentally changed the format from a beatdown-centric format to a format that capitalizes on card advantage generating combos. This deck is the very foundation of what Goat Control decks look like in modern play. Not every single aspect of it has aged well, of course, but several aspects of it are far ahead of its time. These are the notable elements of his deck. 3 Scapegoat and 3 Metamorphosis. A lot of players used only 1-2 of both cards, but Luc realized it was one of the most powerful combos in the format and that maximizing it was worth it. A pair of Night Assailants. This enabled him to make discard costs free. alongside Sinister Serpent. He uses Tribe-Infecting Virus, Card Destruction and Lightning Vortex to capitalize on free discards. Slate Warriors. 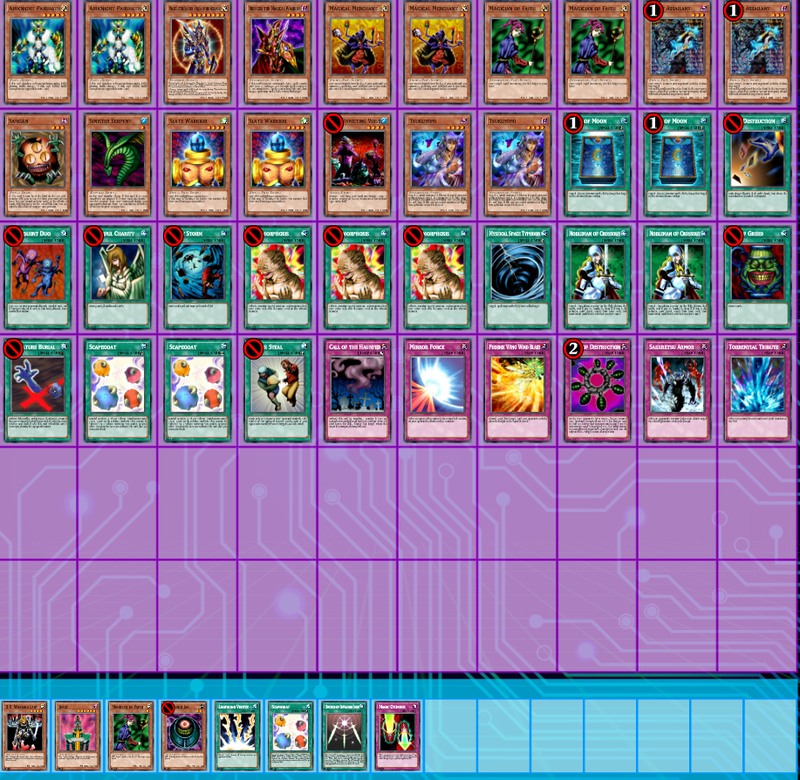 Keep in mind a lot of the decks at the time ran LV4 beater monsters. Slate Warrior’s 1900 ATK overpowered them and Luc’s ability to retrieve it from the graveyard, as needed, with Night Assailant increased its consistency. 3 Magician of Faith. His deck was Spell-oriented and Goat/Meta were spells. Plus Pot/Graceful/Tsukuyomi abuse. His deck was about capitalizing on the most important combos as much as possible. Some of his choices were suited for the meta then, but aren’t ideal now. Magic Cylinder and Swords of Revealing Light repelled beaters, yet allowed TER to consume them, but those cards in modern Goats just end up giving opponent’s space to play defensively. He used a Lightning Vortex instead of 2nd Nobleman of Crossout because face-up monsters were more of a threat at the time. Slate Warrior was good in a format full of 1700-1800 ATK monsters but is now dated. Jinzo is plain inferior to a 2nd Airknight Parshath. Players find 3 Magician of Faith to be too vulnerable to Nobleman of Crossout, while Magical Merchant wasn’t truly discovered yet at the time. Also, Luc ran no Book of Moon because it wasn’t great against beatdown, though it’s essential against TER now. Here’s my modern version of his deck, for fun.